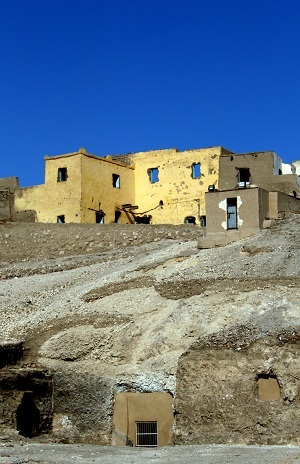 The Old Gourna Village is built on top of ancient tombs. The village has been evicted in 2009, today it is supposedly off limit to residents and tourists, but one could slip past the guard and get a closer look. “Villagers said my father was mad, even our family thought the same, when he decided to restore the house. Why save a crumbling house? Why not just pull it down and build a new one?” says 28-year-old Sara as she gives my sister and I a tour of her mud-brick home in New Gourna Village. The house was a legacy of Hassan Fathy (1900-1989), a renowned Egyptian architect dubbed the Father of Architecture for the Poor. 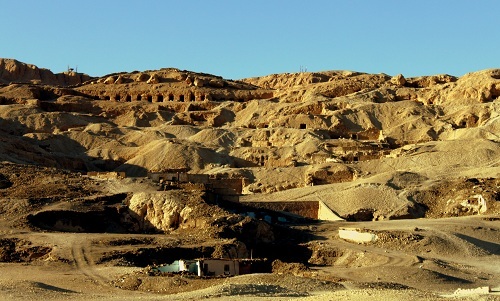 The New Gourna Village was an experiment project built between 1946 and 1952, it was meant to relocate a community living on top of ancient Egyptian Pharaonic tombs to reduce damages to ancient treasures. 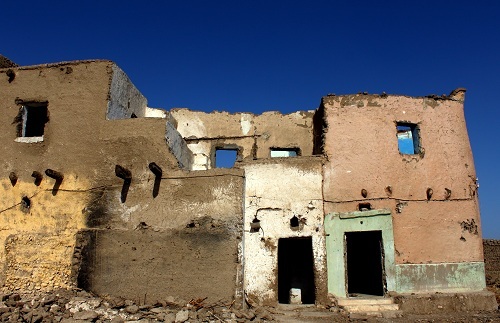 For nearly two centuries, the residents of Old Gourna Village literally living off the dead. They are landless peasants sitting on a gold mine of archaeological treasures, their ancestors mined the tombs, illegally excavating and trading ancient artefacts, or melting ancient jewellery to sell them for the current price of gold; but mostly, they are peasants in poverty, as they channelled their loot to antique dealers for a fraction of the real value. As time passed, laws and enforcement tightened, meanwhile ancient treasures diminished, some residents ventured into forgeries of artifacts, while some turned to tourism, selling souvenirs that are replicas of ancient artefacts, or offering tour of their homes leading straight to ancient tombs. In the 1940s, Egypt’s Department of Antiquity commissioned Hassan Fathy to design a pilot housing project to entice some 7,000 residents to leave Old Gourna. Sara’s grandfather was one of the first villagers to embrace the experiment, when others resisted the relocation plan (which failed back then, but forced demolition came in 2009, Old Gourna is today truly a ghost town, leaving the dead to rest in peace). In 1947, Sara’s grandfather was compensated under the relocation scheme with a spacious adobe custom-made by Hassan Fathy, who engaged the villagers to learn of each household size, each family’s functional needs, lifestyle, working space, and community interaction pattern prior to design and build. Sara’s home is a two-floor traditional mud-brick building; it has nine rooms topped with dome-shaped ceiling, its front and inner courtyards are spacious, it has labyrinth of corridors fit for hide and seek, it is equipped with wind catcher for ventilation, and protected by over 1m thick walls to ward off heat in the summer and cold in the winter. In today’s term, it’s green architecture. 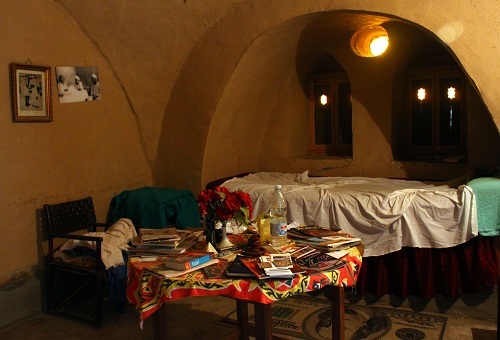 A dome-ceiling room in one of the mud-brick house designed by Hassan Fathy in New Gourna Village. Yet, it was built as a prototype for the experiment and without strong foundation, over the years, as underground water level rising, the mud-bricks closer to the ground began to melt away, and the house without any wooden beam support started to sink, and walls showed cracks. Moreover, the house was built in an era when piped water, electricity supply, and underground sewage system were uncommon, thus, when Sara’s father undertook the restoration work some 15 years ago, the makeover effort was enormous and costly. Today, Sara’s home is the few original houses, along with a mosque, designed by Hassan Fathy left standing in New Gourna Village, where most residents have replaced the old crumbling structures with matchbox houses expanding vertically. Sara’s home is now a private living museum (entrance fee on voluntary basis), my sister and I stumble upon it while cycling in the west bank of Nile River in Luxor. 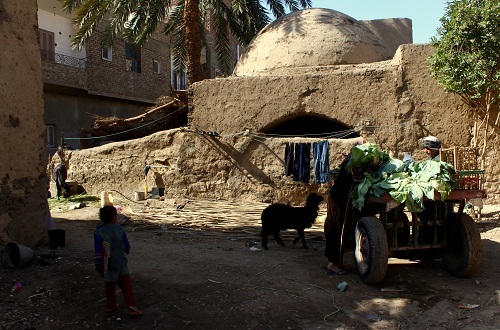 On our way from the west bank ferry port to the Valley of the Kings, and Tombs of the Nobles (Unesco World Heritage Sites of Ancient Thebes), we noticed a group of low, earth colour, dome-roof houses that look very different from the surrounding landscape. 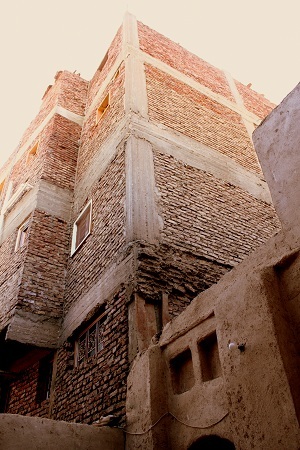 We are used to seeing matchbox houses in Egypt, blocks and blocks of them in varying heights but look half completed, because many have pieces of walls missing here and there, naked windows, or have columns of steel bars protruding on the flat roof for future expansion, and many are without a coat of paint, exposing the rough bricks and cement work; sometimes, we wrongly think that the buildings are abandoned or half-demolished, but satellite dishes and lines of clothing put out to dry reveal the contrary. Thus, when we discover Sara’s home and the nearby mud-brick mosque, they look like from another time zone. 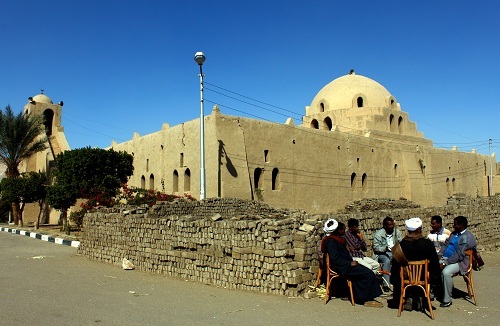 In fact, the architectural style is from the Nubian region in southern Egypt, even during Hassan Fathy’s time, skilled mason of this type of traditional mud-brick structure without centre support was becoming an endangered species due to low market demand. 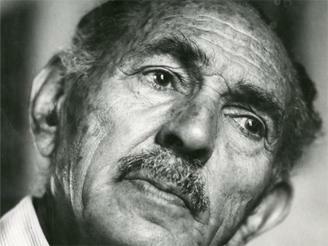 Hassan Fathy, one of the most influential architect of 20th century. He's also a talented writer, musician, and engineer. The New Gourna village experiment offered such opportunity for Hassan Fathy to translate his ideal into reality. He believed architecture must be shaped by factors like the wind, sun, nature and the individuality, and culture of the residents involved; he championed that the poor deserved as much as the rich of decent accommodation that respect individuality, and scorned mechanical construction based on money, industry, greed, and snobbery that homogenizing people of different needs and traditions into moulded cells. In his book Architecture for the Poor: An Experiment in Rural Egypt, Hassan Fathy detailed the process of building New Gourna Village. Though the project was a failure, as it was never completed as planned due to multiple factors; the book was a great success and brought Hassan Fathy to global celebrity status. He received international acclaim and awards; he inspired a generation of architects and urban planners in search of sustainable development rooted in culture, tradition, and nature. Yet, ironically, back in New Gourna, the people he had hoped to help are not as appreciative. This is evidence as more than half of what was built during the experiment are today gone, as villagers tear down low-rise mud-brick houses in favour of fire-brick multi-floor buildings, exactly the sort of “ugly building” Hassan Fathy scorned. 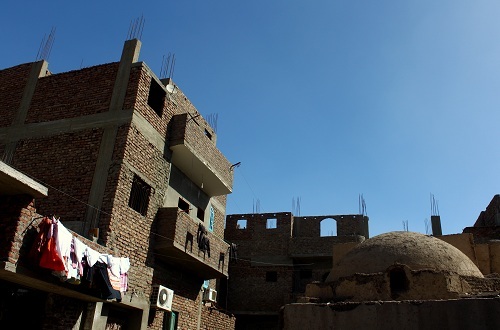 multi-floor buildings rising up beside the low-rise mud-brick house in New Gourna Village. The changing landscape of New Gourna village has attracted the attention of Unesco World Heritage Centre, which initiated a three-year-programme (2010-2013) to safeguard the heritage of Hassan Fathy’s New Gourna. Among the reasons stated for such initiative include: Hassan Fathy’s ideas derived from humanistic values and vision on sustainable architecture merits attention; and that the disappearance of New Gourna Village, which is considered a critical experiment in the implementation of Hassan Fathy’s philosophy, would be a great loss for humanity. Aesthetic wise, the New Gourna village may not look as “scenic” or “picturesque” as it used to be, but is restoring Hassan Fathy mud-brick houses as Sara’s father did an answer to local needs? I can’t help but ponder. The changes in the village over the past few decades are not driven by developers or industrialists, but instead, it’s the locals themselves who made the conscious choice of converting the buildings according to their immediate needs – rebuilding is cheaper than restoring, and growing number of family members but no additional land available, so the natural choice is to develop upwards. If Hassan Fathy’s philosophy is to “let your buildings grow from the daily lives of the people who live in them, shaping the houses to the measure of the people songs, weaving the patterns of a village as if on the village looms, mindful of the trees and the crops that will grow there, respectful to the skyline and humble before the seasons”, then it is rather ironic that the course of lives and loom patterns of the village has spun in today’s direction. There’s a saying that goes in the village: “Rebuilt with Hassan Fathy’s spirit, but not with Hassan Fathy’s mud-bricks”. Well, this could invite multiple interpretations. I feel that the only practical and persuasive reason for New Gourna villagers to opt for restoring and preserving Hassan Fathy’s legacy would be – there’s an economic gain at the end of the day. The village, being different in architectural design and layout, combined with the brand name effect of a celebrated architect, could be a draw for tourism. When the Old Gourna village was finally demolished and villagers evicted in 2009, one of the most common villagers’ complaints was the losing of tourism income – tourists come to see homes built on top of tombs, yet who would be interested in going to a relocation site with no character and no story to tell? The New Gourna village, with Hassan Fathy’s legacy, has an asset to mitigate such problem and elevate the pressure of unemployment and livelihood of the poor. The village then would become like a showpiece for “green and sustainable architecture”, but would it truly achieve the ends of sustainability? I guess that is open for debate. Part of the demolished Old Gurna Village, where homes are built on top of ancient tombs. 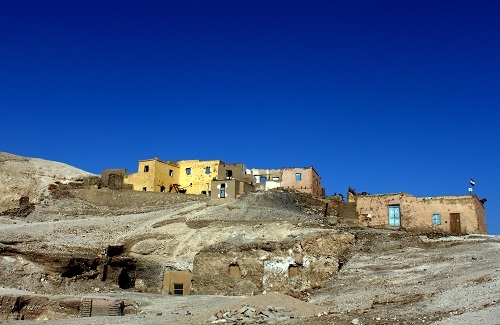 The abandoned Old Gourna Village in the west bank of Luxor, Egypt. 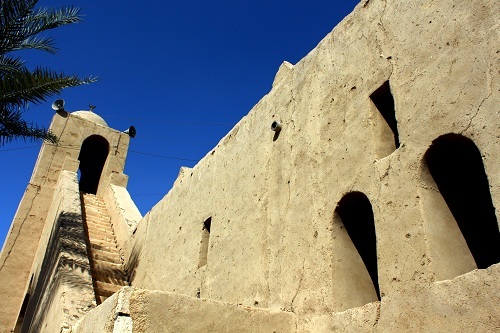 The mud-brick mosque designed by Hassan Fathy. New Gourna Village, west bank of Luxor, Egypt. The unique minaret of the New Gourna mosque designed by Hassan Fathy. 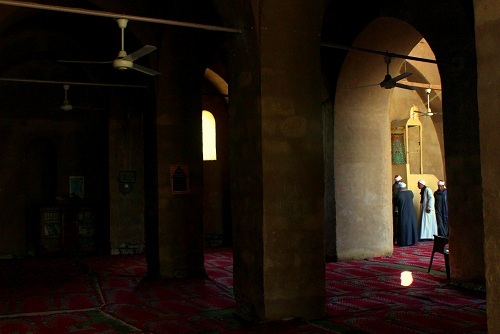 Inside the New Gourna mosque designed by Hassan Fathy, it is still in use today. 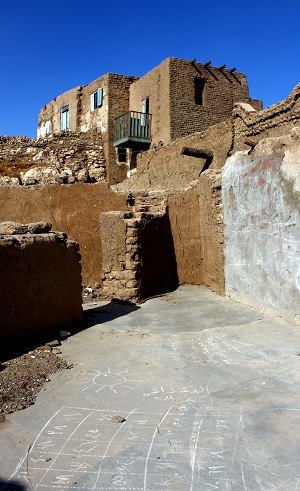 New Gourna villagers have replaced many mud-brick houses designed by Hassan Fathy with fire-brick multi-floor buildings. New Gourna village in the west bank of Luxor, Egypt. remnants of Old Gourna Village, the floor still left signs of the life of previous occupants. Half demolished buildings left standing in Old Gourna Village. In fact, this is one of the reasons why the Classical Egyptian civilization was so sustainable and enduring: their settlements imitated the natural world – they were self-organizing and organically grown from the inhabitants living within.